Survivors of what is believed to be the world's worst rail accident have been telling the BBC News website of their experiences. The Queen of the Sea was nearing its destination when the waves knocked it sideways. Up to 1,500 people were crammed inside the train as it travelled 75 miles (110km) along the Sri Lankan coastline from Colombo to the southern city of Galle. At least 802 died and hundreds remain unaccounted for. The force of the wave threw the train's eight cars into a bog and left the coastal railroad a twisted mess of metal. Like Daya Wijaya Gunawardana, many passengers were with their families, heading off to visit friends and relatives during a holiday week. As the tsunami engulfed the train, the Colombo restaurateur found himself stranded in a flooded carriage, cast adrift from his son and daughter. "The train had stopped at signals," Mr Gunawardana, 62, told the BBC News website. "Then suddenly the sea flooded through the train, very high, very quick. "The water came in about 60ft [20m] from the sea, and the whole train was filled with water. Then it fell over." Reeling from the waves the train spun over and over, cartwheeling four times before coming to rest on a hillock. "I thought that we were killed, that we were dead," said Mr Gunawardana. "But we prayed to our God and because of that I got up to a window and escaped." Mr Gunawardana spent 45 minutes trapped inside the train before he clambered to safety. "People were trying to escape, the whole thing was flooded so everybody tried to get out." Outside, amid the devastation, he found his son Duminda, 32, and daughter Kishani, 31. Neither was seriously injured. "I heard that out of 1,500 people, 1,000 died. When I got out of the train there were a few wounded people, but not many. "Most did not come out of the train. But my family all escaped. I have some pains on my body. It's a narrow escape." Reunited, Mr Gunawardana and his children took sanctuary in a nearby temple but were forced to head to higher ground when fears grew of a second deadly wave. The family trekked uphill for almost two miles before they reached a school. 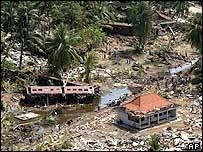 By nightfall on Monday they made it back to Colombo by bus, travelling along inland roads not shattered by the waves. Tourist Danny Shahaf, an Israeli living in London, was also on the train travelling with a friend. "That's when I panicked," he said, recalling the moment when the waves scattered the train's carriages, turning his carriage on its side. "It was so quick, it washed us so far away - the carriage kept filling up with water. "I was telling my friend to run to the front of the carriage, the windows there were still above the water. I pushed my friend through the window to get her up out of the carriage. "There was a woman next to me holding her baby trying to hold the window open with the other hand. As I tried to help her the carriage filled completely, the water pushing the window shut. "Back at the other end of the carriage it was dark, I held my breath, I thought, 'This is how you die'. "As I thought that, the train flipped again and the water slid away and I waded towards the light." Danny made his escape, but the woman with the baby was not so lucky. "There were lots of children on the train," he recalls. Shenth Ravindra, 25, from Crawley, Sussex, also survived the crash. He escaped from his carriage onto a house and then walked two kilometres to a Buddhist pagoda for treatment, despite lacerating his leg. After being reunited with his family at Heathrow airport on Thursday, he said: "The most frightening aspect was when I saw a second wave coming, there was a lot of screaming, the dynamics of the horizon had changed. "I just saw this wall of water coming towards us and then the screaming and the shouting." Mr Ravindra, who said he had to make his way past the dead bodies of children as he escaped, still has metal in his body having survived a serious car crash in 1998. 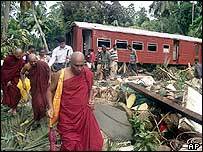 On Wednesday Buddhist monks led services for the dead, burying scores of bodies from the train in a mass grave. They included villagers who had scrambled aboard during a 10-minute pause between the giant waves. Three days after the disaster, rescuers called off the search for survivors. A moment's silence was held to commemorate the dead of all faiths. "This was the only thing we could do. 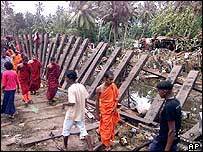 It was a desperate solution," Venerable Baddegama Samitha, a monk who carried out the ritual, told the Associated Press. "The bodies were rotting. We gave them a decent burial."